I’ve been here—OK, we figured it out a couple posts ago—seventeen years. And in all that time, there are still things about this country that make me laugh out loud. Particularly when I compare them to their American equivalent. No, it’s not at all that I find the American equivalent superior. It’s simply the sheer difference that’s entertaining in and of itself. 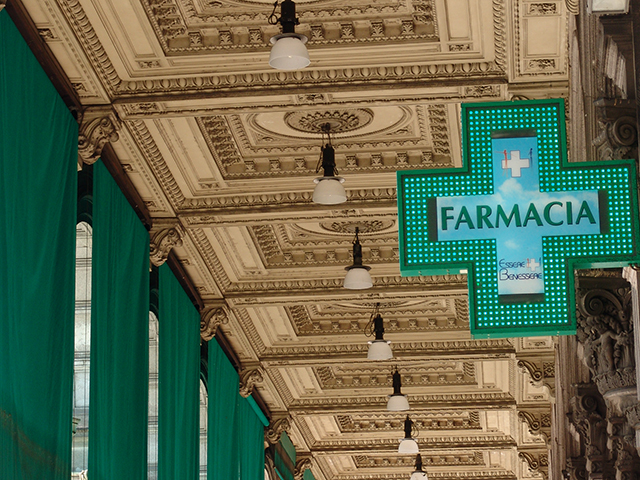 Take pharmacies (one of my favorite things to take into consideration here in Italy as they can be almost museum-quality beautiful compared to their American counterparts.) It seems to me, that in the U.S. along with many other business, pharmacies are there when you need them, 24/7. All bright lights and row-upon-row of “whatever you need” whenever you need it. or, the pharmacies which have been designated to remain open over any given weekend so that people in need can actually get what they need. You see that little hand-made hole in the night grill? 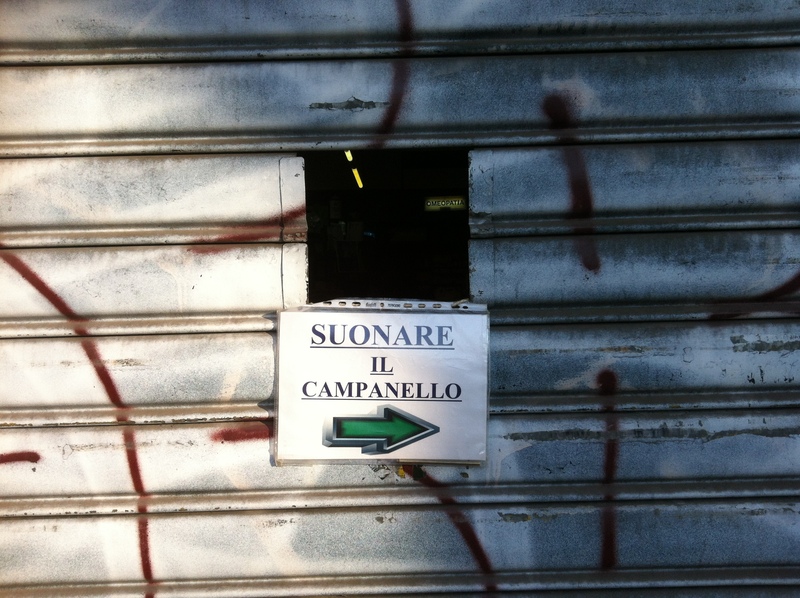 That’s where you go, after you ring the bell, as instructed by the handmade sign pointing to the right. The pharmacist appears at the hole (he has to bend down as he’s rather tall), asks you what you want, and several seconds later comes back with your parcel. You pay (through the hole), and that’s the end of that. No muss, no fuss, no risk of the pharmacy being robbed, no having to actually—God forbid—cross the threshold and go inside. Nope. If you want that luxury you’ll have to wait for Monday. 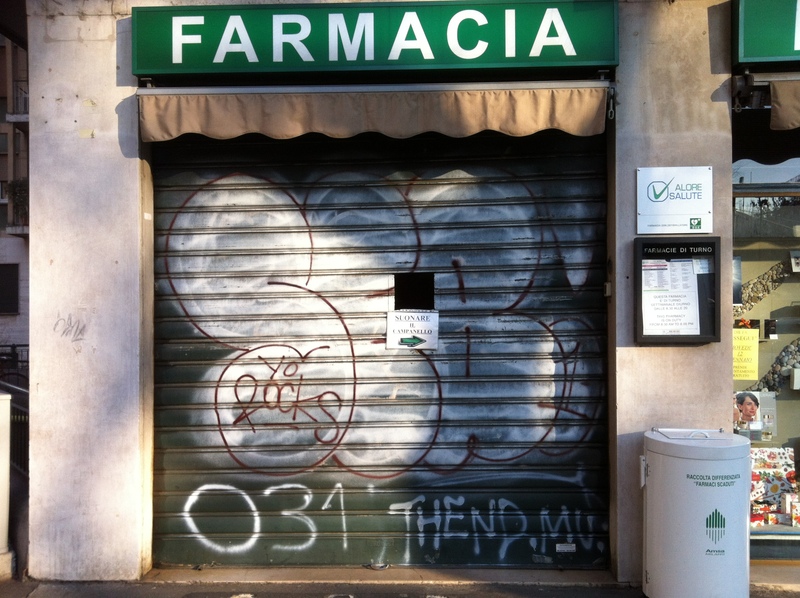 This entry was posted in AROUND US, ITALY and tagged farmacia di turno, funny, MIlano, pharmacy. Bookmark the permalink. I love the graffiti too. Yo Rocks! The graffiti actually made me think there really wasn’t anything there. But WOW! A hole and you can get whatever you need. Maybe we need to think of things like that here in the States. Twice a year and I love it every time. Actually, the “ceiling” is the tiling in an outside breezeway near the Duomo of Milano and the pharmacy underneath it is NOT the same pharmacy with the metal grill. Two different beasts.